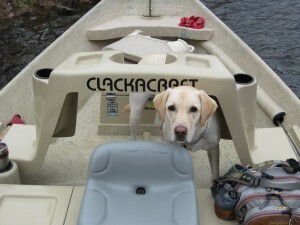 What does a fly fishing guide and his yellow lab do on a rare day off? The go fly fishing of course! Bo and I had just a great day on the river yesterday. The day started fast with this fat Rainbow on the third cast with a Chuck’s Chunk streamer. 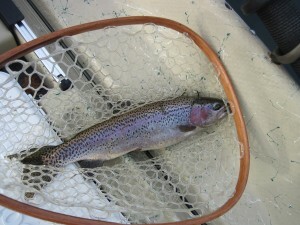 The Rainbow bite was good all day long on #14 RG/PT Cruisers, #16 Smokey Olive Sowbugs and the new LolliPop fly. Did I mention that I chased the tennis ball all over the river? I think Bo is worn out from throwing that tennis ball! There are finally a few beds being dug on the shoals so the Brown Trout spawn is just beginning. Please take care while wading the shoals and please leave the spawning fish alone to do their thing as it is the future of our fishery. It does not take any skill to catch a spawning Brown Trout. It is shaping up to be a great winter of fly fishing so book your trip with us at Empty Creel Fly Fishing Guides and Outfitter.